The U.S. Geological Survey's (USGS) Prompt Assessment of Global Earthquakes for Response (PAGER) system, operational since mid 2007, rapidly estimates the most affected locations and the population exposure at different levels of shaking intensities. The PAGER system has significantly improved the way aid agencies determine the scale of response needed in the aftermath of an earthquake. For example, the PAGER exposure estimates provided reasonably accurate assessments of the scale and spatial extent of the damage and losses following the 2008 Wenchuan earthquake (Mw 7.9) in China, the 2009 L'Aquila earthquake (Mw 6.3) in Italy, the 2010 Haiti earthquake (Mw 7.0), and the 2010 Chile earthquake (Mw 8.8). Nevertheless, some engineering and seismological expertise is often required to digest PAGER's exposure estimate and turn it into estimated fatalities and economic losses. This has been the focus of PAGER's most recent development. With the new loss-estimation component of the PAGER system it is now possible to produce rapid estimation of expected fatalities for global earthquakes (Jaiswal and others, 2009). While an estimate of earthquake fatalities is a fundamental indicator of potential human consequences in developing countries (for example, Iran, Pakistan, Haiti, Peru, and many others), economic consequences often drive the responses in much of the developed world (for example, New Zealand, the United States, and Chile), where the improved structural behavior of seismically resistant buildings significantly reduces earthquake casualties. Rapid availability of estimates of both fatalities and economic losses can be a valuable resource. The total time needed to determine the actual scope of an earthquake disaster and to respond effectively varies from country to country. It can take days or sometimes weeks before the damage and consequences of a disaster can be understood both socially and economically. The objective of the U.S. Geological Survey's PAGER system is to reduce this time gap to more rapidly and effectively mobilize response. We present here a procedure to rapidly and approximately ascertain the economic impact immediately following a large earthquake anywhere in the world. In principle, the approach presented is similar to the empirical fatality estimation methodology proposed and implemented by Jaiswal and others (2009). In order to estimate economic losses, we need an assessment of the economic exposure at various levels of shaking intensity. The economic value of all the physical assets exposed at different locations in a given area is generally not known and extremely difficult to compile at a global scale. In the absence of such a dataset, we first estimate the total Gross Domestic Product (GDP) exposed at each shaking intensity by multiplying the per-capita GDP of the country by the total population exposed at that shaking intensity level. We then scale the total GDP estimated at each intensity by an exposure correction factor, which is a multiplying factor to account for the disparity between wealth and/or economic assets to the annual GDP. The economic exposure obtained using this procedure is thus a proxy estimate for the economic value of the actual inventory that is exposed to the earthquake. The economic loss ratio, defined in terms of a country-specific lognormal cumulative distribution function of shaking intensity, is derived and calibrated against the losses from past earthquakes. This report describes the development of a country or region-specific economic loss ratio model using economic loss data available for global earthquakes from 1980 to 2007. The proposed model is a potential candidate for directly estimating economic losses within the currently-operating PAGER system. PAGER's other loss models use indirect methods that require substantially more data (such as building/asset inventories, vulnerabilities, and the asset values exposed at the time of earthquake) to implement on a global basis and will thus take more time to develop and implement within the PAGER system. Jaiswal, K.S. 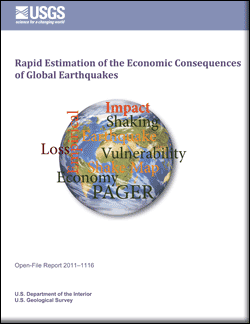 and Wald, D.J., 2011, Rapid estimation of the economic consequences of global earthquakes: U.S. Geological Survey Open-File Report 2011–1116, 47 p.